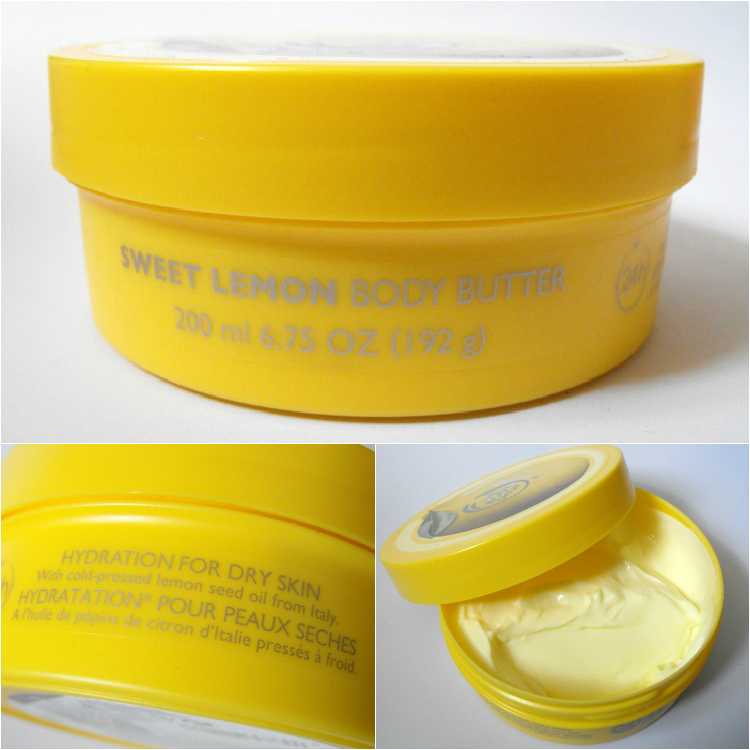 Sophsterlicious • UK Blog: The Body Shop Sweet Lemon Body Butter. The Body Shop Sweet Lemon Body Butter. I actually feel ashamed to admit this, but this is the first body butter from the body shop that I have tried. Well, I was once given a sample in a teeny tiny tub with a purchase, but there was barely enough for my hands in that.. and it was coconut flavoured, and I don't like coconut much. Anyway, that has changed because I got the Sweet Lemon Body Butter* and I have been using it loads for the past month or so.. I am converted. Wow! .. Now I see what all of the hype was about. This is like nothing else, it's like a dreamy delicious fluffy scented dream for your skin. Just yummy! The texture is thick, yet a little spreads a long way. They are SO hydrating and will smooth the dryest skin. I just love applying this after a shower. It leaves me smelling delicious and feeling so smooth and fresh. I cannot wait to delve into more of these delights from The Body Shop! Full size body butters are £12.50, but you can get two for £15... Bargain! i love the body shop body butters. I own the strawberry and it smells the best. I would love to try lemon as I'm such a fan of lemon and citrus scents. I have to look for this. My husband loves anything with a lemon scent. It's a sickness lol. Beauty UK - Paint For Life. New CID i-glow - Sirocco. Gloosybox For Men, Take Two! Orly Nail Polishes, Glitter and a NOTD. Review: Cover FX Eye Prep.